WARNING: The rest of this post will contain spoilers for the entire season, so don't read any further if you haven't watched every first season episode. 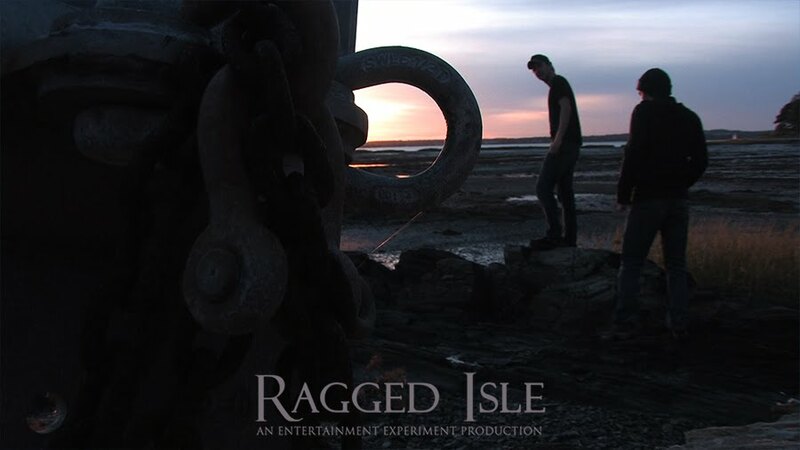 At a very early writers' group meeting, back in January of 2010, we decided that we wanted the first season of "Ragged Isle" to climax at a lobster festival. We weren't sure what was going to happen, but we knew it was going to be catastrophic, involving several deaths. What if we combined 1) and 2), shooting footage at a real lobster festival, but also staging a fake festival at another location on another day for the gaudier mayhem we had in mind. And that is what we did. In August, Barry and some of our actors headed up to the Rockland Lobster Festival to get some authentic festival footage. A Tarot card reader at the festival was nice enough to let actress Kat Morrison (Madame Clelia) sit in her booth long enough for Barry to get some shots of her. And April Joy Purinton (Rachel Moody) got to do her spooky zombie shuffle through authentic festival crowds. Then in September, we all headed down to Two Lights State Park in Cape Elizabeth to stage our "fake" lobster festival, to be intercut with footage from the real deal. That day was not without difficulties, but we persevered, guided by the cool professionalism of Karen and Barry. More than any other episode this season, I think, this one was really found in editing. If you pay attention to the dialogue, you'll notice there isn't that much. And when bad things start to happen, they happen very, very quickly. The script as written was only three or four pages, which usually translates into about three or four minutes of screentime. But Barry crafted a ten-minute episode out of the footage he shot. Bravo, dude. A note on cliffhangers. Cliffhangers can be frustrating, can't they? But we're asking you to trust us that we know where this is going. We're only half-way through our story, and there is so much more story to tell. We can't wait to share the rest with you. Dedicated to Ragged Isle fans swampyankee1 "If I don't get the t-shirt can I have the shackle??" and Indie Intertube's Destini "That opening shot was so pretty, it hurt." "Ragged Isle" episode nine is up. After you watch, read through to the rest of the post for a behind-the-scenes perspective from the head writer. WARNING: The rest of this post will contain spoilers for episode nine (and earlier episodes), so don't read any further if you haven't watched. Very early on in the scripting process, but after we had mapped out most of the major story points we wanted to cover this season, Barry came to me and said, "I want to do a talent show episode." "Okay," I said, cautiously. The talent show premise is a staple of many long-running TV series (especially sitcoms), usually turning up fairly late in the series' run, after the writers have run out of ideas and the actors have gotten thoroughly bored with their characters. Neither was the case with "Ragged Isle," and I wasn't really sure how to approach it. But then Barry said: "And Karen and I are going to write it." "Okay!" I said, far more enthusiastically. It soon became clear that Barry and Karen had something more in mind than simply giving the actors a chance to show off their underutilized talents. They wanted an episode that would be funny and entertaining, but would also advance the emotional arc of the season. With a song. As originally scripted, the song Rachel and the Sheriff sing was going to be Olivia Newton John's classic, "Magic." However, after repeated requests to obtain the rights to that song went unanswered, Barry wrote the original song you heard here. I think we traded up. I did take a pass on the script after Barry and Karen turned it over to the collective, coining the phrase "Lobster of Ceremonies" (you're welcome), and contributing Vance Trundle's dialogue with the Sheriff, as well as a few other bits of dialogue here and there. But this episode enjoyed creative contributions from everyone involved. Sebastian Carlsen, who dabbles in stand-up, came up with his own comedy routine. Adam Cogswell originated his magic act (and costume). Michael Dix Thomas and Ian Carlsen choreographed their Awesome Times Two dance routine. Awesome. Amie Marzen's aggressively sunny take on the character of Julie continues to be a joy to behold. And Barry's band The Lodge were April and Rick's backup musicians. April and Rick! Charged with doing the emotional heavy lifting of the episode, April and Rick really delivered on Barry's song. It seems clear that Sheriff Dalton and Rachel's relationship is in different place when the song ends than it was before it began. That's quite an achievement -- a testament to the power of the writing, the song, and Rick and April's talent. Well done, all around! By the way, many thanks to Geno's Rock Club, a friend to this project from the beginning, for providing the location for this episode and for hosting our premiere party in March.